What’s the gender-neutral word for an individual mermaid (Ariel) or merman (Triton) of unknown gender? German: die Nixe (f.) and – rarely – der Nix/Neck/Nöck (m.), e.g. in Grimm’s “The Nixie of the Mill-Pond” and “The Water Nixie”. Descriptive fish-tailed person, person with fluke or human-dolphin chimæra? Most illustrations don’t use vertical tailfins but horizontal flukes as found in dolphins and whales, but often greenish scales, sometimes gills and no blow-holes. Mermaid as a gender-neutral term, distinguished as either merman or *merwoman (or *merboy and *mergirl)? Singular use of the plural words merpeople and merfolk? This group of fictional beings is of course inherently sexist, with female mermaids usually being described as beautiful nymphs or sirens and less popular male mermen frequently being depicted as strong but ugly green-haired homo aquensis. Also, maid is archaic and not commonly seen as a neutral lexemic antonym of man. Unicode is adding a respective generic 隆 emoji to version 10 of its standard at code point U+1F9DC. Its official name – which can be changed only until mid-2017 – currently is merperson. Singular of folk would just be "person." 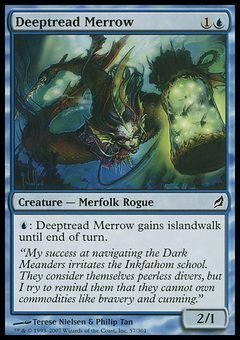 Merfolk would be a community of merpeople, or a merperson if singular. The word "merrow" has been used as a (possibly) gender-neutral for similar creatures. It is not actually as closely related to "mermaid" and "merman" as it might appear (although it is ultimately related). It comes from an Irish word, so it is mainly used in Irish English and to refer to mermaids and mermen in the context of Irish folklore. Also, it seems mermen are rare in Irish folklore, and the term "merrow" is only viewed as including males by some people: others view it as an exclusively feminine designation (for example, this website about "Irish Fairies"). The Oxford English Dictionary defines the word merrow as "a mermaid or a merman," and says it comes from Irish "muruach, murúch < Early Irish murdúchann siren < muir sea (see mere n.1) + dúchann song". The root of muir is the same as German Meer, Latin mare and the archaic English mere. Wikipedia says that there was some uncertainty in the past about the derivation of the second half of the word. The usual pronunciation is given as /ˈmɛroʊ/, although this seems to be derived from the spelling (the OED says that the English Dialactal Dictionary recorded the pronunciation as /ˈmərə/). Wikipedia also says that "The merrow which signifies 'sea maiden' is an awkward term when applied to the male, but has been in use" which isn't exactly a glowing endorsement of this usage, but I think anyone would agree that it at least doesn't sound as awkward as "mermaid" in reference to a male. I'm not sure I would recommend using "merrow" as a gender-neutral singular, but I think it's at least good to be aware of the word when considering your options. What is a gender-neutral way of saying “middle-man”?